Even though I purposely got there an hour after show time (scheduled for 8 PM), I still had to wait through 3 different openers. The highlight during this time was Lupe coming out for a couple of songs during Billy Blue's set (they performed "Chopper", which is a Lupe song featuring Billy, and another tune which I would guess based on Lupe's instruction is titled "Fundamentals"). Needless to say, Lupe got onstage pretty late - probably after 10:30. The first half of the show was a condensed version of Tetsuo & Youth, Lupe's latest album. He claimed this part of the show was for himself, because he really loved the songs on the album. 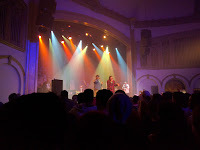 During this portion, he performed almost like a rock lead singer would - rapping at the mic stand, with relatively subdued movements; it also included a bunch of the interludes from the album. He later revealed that he was having problems with his voice, and was trying to tone it down to save it for the whole show. But I feel like the Tetsuo part of the show would probably be less animated anyway. There were also a couple of stoppages - one was due to technical difficulties with his earpiece, while the other briefer ones seemed to be either due to voice or flubbing the lyrics. The second half of the show was for "us" - he went through all his classic hits, often not finishing a song all the way through since he was running short on time. He was also way more animated during this part, bouncing around in a more expected fashion. One highlight was a portion of the show where he pitted the right and left sides of the crowd against each other in a competition to see who could "turn up" more when the beat dropped. Each side had a couple of turns (one practice, one for real), before he had us all go at once. See the video below for the left side taking their second turn. At the end of the show he apologized to the crew of the venue for going over the (apparent) midnight curfew, laying the blame on himself. 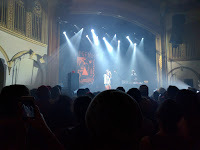 He also promised the audience that he owed us 15 more minutes, and would honor that by returning to Seattle for a 15 minute show before the end of the year - he would rent out the same venue, and we would be able to get in with the ticket stubs from this show.